This past week I've been helping my sister move off to college and totally having a blast spending this time with her. While I've been traveling for work with a little family fun in between, I've been stranded thousands of miles away from my favorite LA based boutiques. Online shopping has been my ultimate savior. 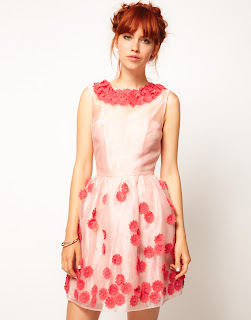 One of my favorite places to get dresses, skirts, and all things fabulously girlie is ASOS! You may remember getting a sneak peek at their latest collection when I attended the fall preview here. My most recent purchase was this striped skater dress, which sorta reminded me of an ice skater and with the Olympics in full swing, I thought what the heck. The trendy color palette makes it the perfect summer dress, plus you all know I'm a total sucker for anything striped, exhibit A, B, and C. Below are some of my latest fash finds from the always fabulous ASOS! Which piece is your fave? Click the picture to shop the look! Very beautiful ring ;) I love spending time with my sister too! You look beautiful! Adorable dresses! You look lovely as always! :-) I love your dress - it's so cute and girly for Summer! Love the outfit! Very cute! Have a blast with your sister! This dress is sooo cute !!! This striped dress is amazing! I love this combo. Very fashion. Out of the box and fabulous. Adore your dress & you know I love a bit of leopard!! My favourite one is that graphical one with different shades of blues. Just bought D&G leopard ballerinas - they go with everything! I just bought a pink pleated skirt from ASOS, now waiting for the warmer weather in Melbourne so I can wear it! Anna this dress is amazing. I love how you partnered it with the leopard flats. An inspired idea. Glad you're having a good time with your sis. Could you imagine how amazing a skater would look in this striped dress and a leopard print cover over their skates!?!?! What a great inspiration! Hope a skater is watching! oooo, I want this dress. You look amazing, Anna. Where did you get the flats? I'm so in love with ASOS. I could spend my whole pay check on that site every week. I love all the pieces you pulled and of course your dress. Girl, you look so cute. Hope you had a wonderful weekend. ooo love the dress! awesome post! Lovely outfit. Love your combination with the leoprint flats. Looks so pretty and the dress looks amazing. Those shoes are amazing. I love the mixed pattern combo. You look gorgeous. Such a great dress and love the ring! Love the stripes and the white nails look awesome. I love how you wore the leopard flats. Daring and fun. Great post, hun. Love love the striped dress! And the white ring is fab! I really need to order from ASOS, but I'm always scared about sizing when ordering online. you look gorgeous!the dress is great!! 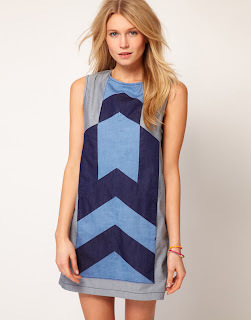 And the geometric shapes blue dress is really cute.. The orange dress is def my fav.. soo pretty! I love dresses that are kinda like fit and flare.. looks good on everyone! I have been eyeing this dress online too...so adorable and you can wear it for just about any occasion! I love that dress! I have been afraid to order anything besides shirts because shorts/pants are so hard to order online. Maybe I should try a dress though! Love, love, love this dress! Stripes and leopard are my fave! I've never shopped ASOS but I think I'll have to! I love the pleated skirt..I've been searching for one like that! always perfect Ann. That dress is too cute! Loving this combo girl - darling! Love this dress SO much! Those flats are so cute with it. You look great! Love the dress with the leopard flats and my favorite dress has to be that orange eyelet number it is just too adorable!! Love the stripes and leopard together! That dress is so fun! Love it with the leopard! I love the mixed prints! ASOS has the cutest stuff..my one-stop shop for clothes & jewelry! I love your dress! So adorable. Totally in love with that dress! ASOS is my go-to! Thanks for sharing this fun outfit! I love stripes too! Your dress is perfection!!! I love everything about this dress - the fit, the stripes, the colour! So pretty! OMG I just saw a girl at Target yesterday wearing that dress and adored it! So glad you posted about it so I know where to get it!! Beautiful dress and ring. You look amaizing. Es precioso el vestido de rayas! Amazing look doll! So cute paired with the leo flats!!!!! I love this dress. The colors look amazing on you and you accessorized it perfectly. such a cute dress love the stripes and that first dress is adorable! nice outfit. love your shoes. Wow, I really love the striped dress with leopard flats! Great idea! Mixing the stripes with the leopard flats is a fab idea! I'll have to give it a shot. Thanks for the great ideas! Great dress, always so beautiful and stylish! Yay! I just posted the pleated skirt on my blog too! Great fashion minds think alike, right!!!??? hah! I don't usually like high necks...but you've won me over! The bright stripes and shapely skirt are really amazing! You look amazing and I love the outfit. You're blog is soo amazing! I love that dress on you. I just started blogging and was hoping you could come visit and possibly help spread the word? Haha, thanks if you do, or even get read my comment :-). That dress is so cute on you!! I love ASOS! They have such adorable items, like the dress that you are wearing! You are one of my favorite bloggers! Thanks for inspiring me! I totally love the dress! What a great kate spade vibe for a fraction of the price! I love love all of these dresses! so pretty! Okay that dress is SO DARN CUTE. Love it! So glad I found your blog through Mimi Boutique. I love the stripes mixed with the leopard flats! Your dress is gorgeous! I also love the navy and gold cuff. 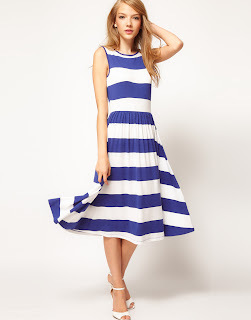 :) And out of those ASOS picks, my favorite is the navy and white striped dress. I've had my eye on it for a while! Cute dress! Love that pattern and style! LOVE the stripes! You look stunning girl! Check out all-time low of among the notice emails and you can pull out at any time.